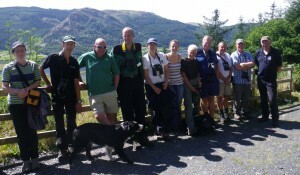 Today, the Lake District Osprey Project hosted a visit from friends and colleagues from the Kielder Osprey Project in Northumberland. Good practice and lessons learned were exchanged, and an agreement was reached to work together more closely in the future as our shared aim of increasing osprey numbers in Northern England moves forward. The thing that binds us together, our birds, performed much nest exercising and were the ultimate film stars when required…..welcome news also came across from Kielder Castle that the newly ringed 6H was feeding well back in Northumberland after yesterdays ringing. Only a week since ringing and the chicks have developed in, if not leaps and bounds, then stretches and flaps. A week ago they had no muscle to speak of and lay quite quiet and still as their leg rings and satellite back packs were put on. At that age they rely on huddling down flat in the nest so their cream and brown feathers can camouflage them from predators. Not so this week! Like Pop-eye after spinach they are standing up proudly on straight white-trousered legs, staring boldly over the edge of their main-mast crowsnest and extending their full sized wings in lazy bicep stretches. And today the flapping begins in earnest. Chick 14 flexes his pinions faster and faster until the air above the nest is a maelstrom and Chick 15 has to cower down out of the way of a potential clip around the earhole. Luckily there is no sign that all this effort will end in a lift off as trailing behind in the growth spurt, tail feathers are still quite stubby. 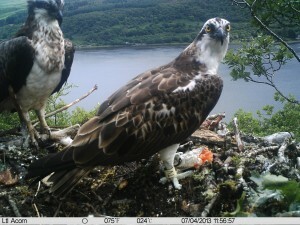 The LDOP learned this week of a chick which fledged from Bassenthwaite in 2008 and is now breeding in Cowal, near Dunoon in Scotland. Along with an unringed female, it has raised a brood of two healthy chicks. The bird was ringed on Weds 9th July 2008, at a nest in Dodd Wood, and was fitted with a yellow identification ring 7V, and BTO ring 137115. Not only is this the first Bassenthwaite osprey known to breed North of the Border, but is a first for this area of Western Scotland for over 100 years…great news! 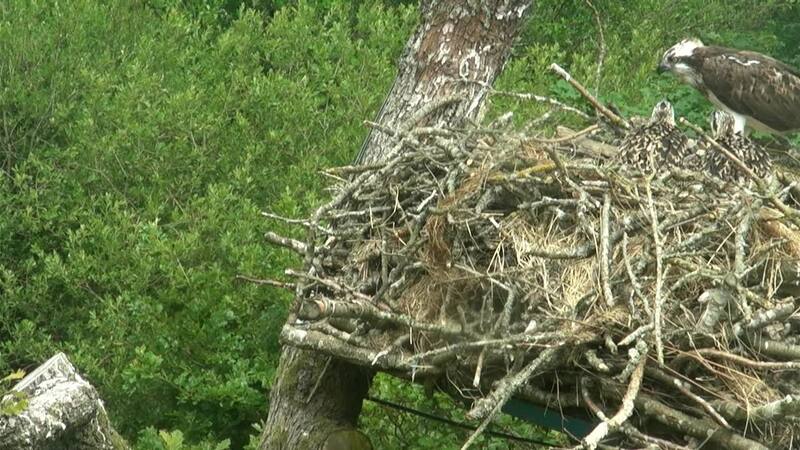 Lake District Ospreys all set for a bright future. On a bright sunny morning at the beginning of this week our two juvenile Ospreys were ringed and fitted with satellite trackers. 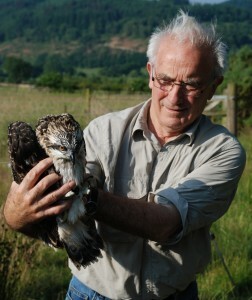 Roy Dennis, Britain’s best authority on Ospreys, came down from his home in Scotland to lead the team of expert ringers. The two birds were first given a quick health check and declared by Roy to be “two very healthy birds” weighing 1450 grams and 1670 grams. The first being a male bird and the second a female bird – female birds of prey tend to larger than the males – they were then ringed with a white ring on the right leg. The male is now White 14 and the female White 15. They were also fitted with satellite trackers so that their futures can be monitored.It should be noted that all the above procedures are carried out under rigorous government licence and that the disturbance of Ospreys on the nest is an offence under the Wildlife and Countryside Act 1981. We have given our chicks their health check, and believe we have a male 14 and a female 15, given their measurements. Both birds are in excellent condition, and appear very healthy. Here they are safely back in the nest with KL attending. Over the season many schools both local and from around the United Kingdom visit the Whinlatter Visitor Centre to look at the CCTV ospreys. Some go further and make Ospreys the subject of their term topic. So, we were really impressed when Montreal School from Cleator Moor brought in the peoms and maths work they had done over the term, inspired by these wonderful birds. The Osprey’s wings are as long and as strong as a rock. It has talons as sharp as a freshly sharpened knife. Its wings are the colour of dark chocolate icecream. The Osprey has eyes like lemons that are fresh from a shop. The father swoops and dives for trout for tea. While hungry chicks stay safe in the eyrie. Preening and feeding her growing young. The chicks have been growing by leaps and bounds from balls of white fluff (week 1) to balloons of brown fluff (week 2) to scaly reptilian mini-monsters (week 3) to the floppy feathered dusters we see this week. 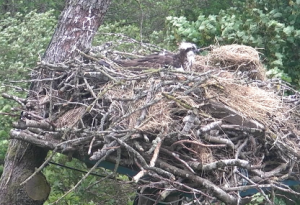 With fish on tap they are keeping well ahead with growth schedule so that today KL did not feel the need to sit over them on the edge of the nest all day but took off to the top of the tree (just out of camera view) to keep a lookout there. Proof of the chicks being permanently full to the brim was obvious in that this morning at 09.45 both Mum and Dad were busy feeding a chick apiece and this afternoon when Dad returned with a fish and ate it on the branch in front of them they just blinked at him lazily, and went back to sleep. Lake District Ospreys Make Hay. 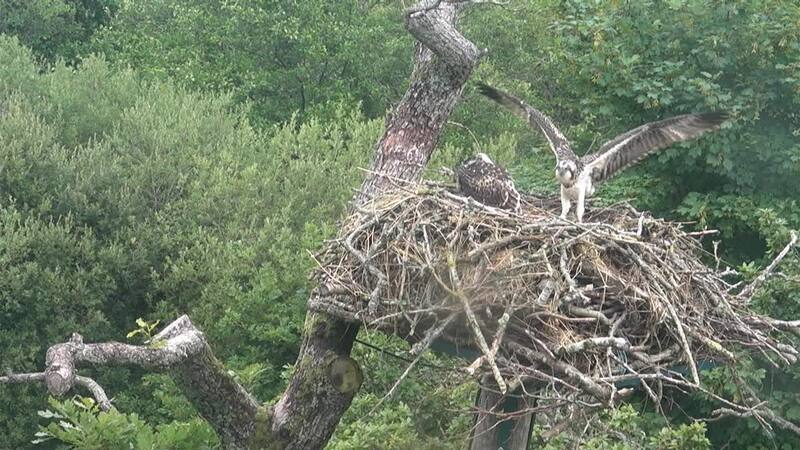 What size do you think the Ospreys nest is similar to? You will find part of the answer when you round an early bend on the way up to the second viewpoint. Here we have a life size model nest – contribute to it if you wish – which we occasionally have issues with. One issue is that humans (yes, you!) tend to get a bit carried away and put large logs on it which an osprey would never be able to carry. An adult osprey can carry half its own body weight, a body of just less than two kilos can therefore carry about one kilo (2lbs?). So large logs are out. The next issue is that people are rather tidy where ospreys are not. Look closely at the picture below and you will see a chaotic collection of sticks, straw and various bits and pieces, even part of a rotten fence post. 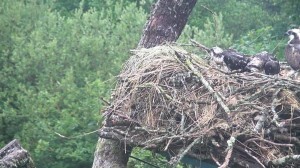 More recently the ospreys have started competing with local farmers in making bales of hay for the nest. An osprey nest is a rather wonderful thing. It evolves from a pudding bowl with a soft moss centre for the eggs and chicks, it is turned into a play pen with stick walls as the chicks grow and finally turns into a helipad from which to fly. What it is not is tidy! Come on folks be untidy for wildlife and start with our nest on the way to the upper viewpoint. Answers to Question 2 are at the top viewpoint along with views of the nest.